According to the 1962 Missal of St. John XXIII the Extraordinary Form of the Roman Rite, today is the feast of St. Theresa of the Child Jesus. Her feast in the Ordinary Form of the Roman Rite is celebrated on October 1. Historically it is the feast of St. Gerard of Brogne who was born in the county of Namur. He trained for the army, as a page of the count of Namur he was sent on a special mission to the French court. He stayed in France and joined the Benedictines of St. Denis. After some eleven years he was ordained priest, and left for Belgium in order to found a new abbey on his own estate of Brogne. He was its abbot for twenty-two years and during that period was instrumental in introducing St. Benedict's Rule into numerous houses in Flanders, Lorraine and Champagne. He was noted for his engaging sweetness of temper. St. Gerard entered this world blessed with the advantages of noble birth and a naturally pleasing disposition which made him universally liked, yet he saw through the emptiness of a worldly life. Upon returning from a hunting trip one day, he retreated to a chapel, where he sighed, "How happy are they who have no other obligation but to praise the Lord night and day, and who live always in His presence." 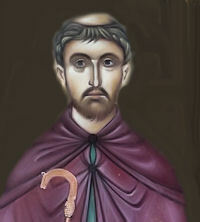 St. Gerard had a vision in which St. Peter asked him to bring the relics of St. Eugenius to Brogne, Belgium. Upon completing this task, St. Gerard entered into religious life at the monastery of Saint-Denis, where he was later elevated to the priesthood. After founding an abbey of monks on his own estate at Brogne, the Saint set up a cell for himself near the church so he could live a life of reclusion. He was not allowed to remain a recluse for long though. God soon called him to reform the abbey of St. Ghislain, where the monks would expose the relics of their founder in exchange for money. Due to his success there St. Gerard was later given the commission to reform all the abbeys in Flanders. For nearly twenty years, he labored for their reformation by the Rule of St. Benedict. Toward the end of his life, St. Gerard made one last general visit to each of the monasteries under his direction, then retired to his cell at Brogne to prepare for his death. St. Theodore (Anne Therese) Guerin was born Oct. 2, 1798, in the village of Etables, France. Her devotion to God and to the Roman Catholic Church began when she was a young child. She was allowed to receive her First Communion at the age of 10 and, at that time, told the parish priest that someday she would be a nun. The child Anne-Thérèse often sought solitude along the rocky shore near her home, where she devoted hours to meditation, reflection and prayer. She was educated by her mother, Isabelle Guérin, who centered lessons on religion and Scripture, thus nurturing the child’s love of God. Anne-Thérèse’s father, Laurent, who served in Napoleon’s navy, was away from home for years at a time. When Anne-Thérèse was 15 years old, her father was murdered by bandits as he traveled home to visit his family. The loss of her husband nearly overwhelmed Isabelle and, for many years, Anne-Thérèse bore the responsibility of caring for her mother and her young sister, as well as the family’s home and garden. Through those years of hardship and sacrifice, indeed through all the years of her life, Mother Théodore’s faith in God neither wavered nor faltered. She knew in the depths of her soul that God was with her and always would be with her, a constant companion. Anne-Thérèse was nearly 25 years old when she entered the Sisters of Providence of Ruillé-sur-Loir, a young community of women religious serving God by providing opportunities for education to children and by caring for the poor, sick and dying. While teaching and caring for the sick in France, Mother Théodore, then known as Sister St. Theodore, was asked to lead a small missionary band of Sisters of Providence to the United States of America, to establish a motherhouse, to open schools and to share the love of God with pioneers in the Diocese of Vincennes in the State of Indiana. Humble and prone to feelings of unworthiness, Mother Theodore could not imagine that she was suitable for such a mission. Her health was fragile. During her novitiate with the Sisters of Providence, she became very ill. Remedies cured the illness but severely damaged her digestive system; for the remainder of her life she was able to consume only soft, bland foods and liquids. Her physical condition added to her doubts about accepting the mission. Nevertheless, after hours of prayer and lengthy consultations with her superiors, she accepted the mission, fearing that if she did not, no one would venture to the wilderness to share the love of God. Equipped with little more than her steadfast desire to serve God, Mother Théodore and her five companion Sisters of Providence arrived at the site of their mission at Saint Mary-of-the-Woods, Indiana, the evening of October 22, 1840, and immediately hastened along a muddy, narrow path to the tiny log cabin that served as the chapel. There, they knelt in prayer before the Blessed Sacrament to thank God for their safe journey and to ask for God’s blessings for the new mission. Here, on this hilly, ravine-cut, densely forested land, Mother Théodore would establish a motherhouse, a school and a legacy of love, mercy and justice that continues to this day. Less than a year after arriving at Saint Mary-of-the-Woods, Mother Théodore opened the Congregation’s first Academy and, in 1842, established schools at Jasper, Indiana, and St. Francisville, Illinois By the time of her death on May 14, 1856, Mother Théodore had opened schools in towns throughout Indiana, and the Congregation of the Sisters of Providence was strong, viable and respected. Always, Mother Théodore attributed the growth and success of the Sisters of Providence to God and to Mary, the Mother of Jesus, to whom she dedicated the ministry at Saint Mary-of-the- Woods. Mother Théodore’s holiness was evident to people who knew her, and many described her simply as “saintly”. She possessed the ability to draw out the best in people, to enable them to attain more than they thought possible. Mother Théodore’s love was one of her great hallmarks. She loved God, God’s people, the Sisters of Providence, the Roman Catholic Church and the people she served. She did not exclude anyone from her ministries or her prayers, for she dedicated her life to helping people know God and live better lives. Mother Théodore knew that alone she could do nothing, but that all things were possible with God. She accepted trials, trouble and occasions when she was treated unjustly as part of her life. In the midst of persecution, Mother Théodore remained true, a faithful woman of God. Mother Théodore died sixteen years after she arrived at Saint Mary-of-the-Woods. During those fleeting years, she touched a countless number of lives—and continues to do so today. The gift she gives to each succeeding generation is her life as a model of holiness, virtue, love and faith.